Are Crises in Argentina and Turkey Harbinger of the Global Crash? Some emerging markets, Argentina and Turkey in particular, deal with the economic crises, while their currencies are continuing their collapse. The Fed Chair, Jerome Powell, has recently said that “the role of U.S. monetary policy is often exaggerated”. On the other hand, many analysts believe that the Fed’s tightening causes a dollar shortage and pushes emerging markets into trouble. Indeed, there is something in it. We don’t have to invoke the Latin America debt crisis in the 1980s, it is enough to recall the taper tantrum from 2013, when the Fed’s tapering lead to the global panic, the spike in bond yields and the capital outflow from the emerging markets. So are the dramatic events in Turkey and Argentina (and other countries) a tip of the iceberg of a broader systemic crisis across the emerging markets? Let’s see. Turkey runs currently one of the largest current account deficits in the world, so it relies heavily on capital inflows and foreign borrowing to fund itself. 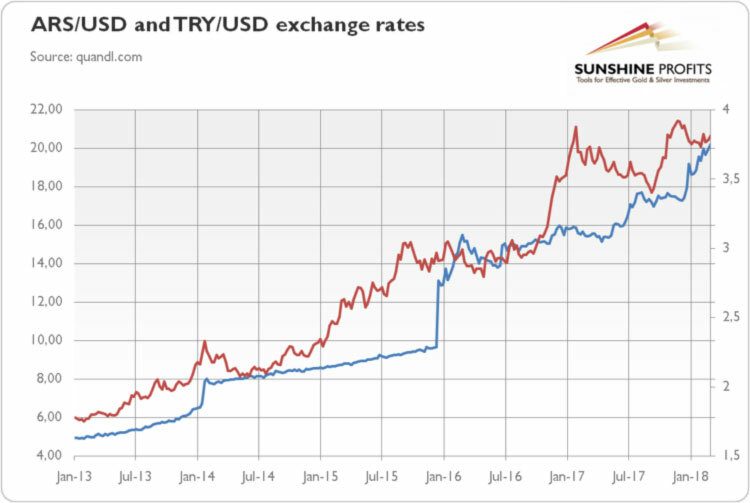 Due to the institutional decline, including the Erdogan’s dismantling of the rule of law and interference in the central bank’s activities leading to too easy monetary policy, the Turkish lira plunged, pushing the country into the debt crisis. Argentina’s peso is also in free-fall, even though the central bank hiked its interest rate to 40 percent. Inflation is 25 percent and might get worse. In turn, the government was forced to seek the aid from the IMF, a humiliating twist for a country that hates this organization. The chart below shows the depreciation of the both currencies against the U.S. dollar over the few last years. 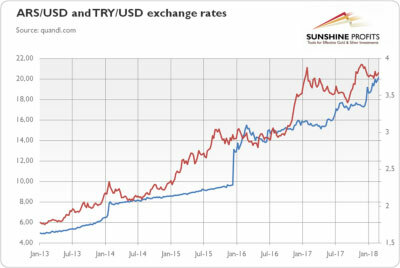 Chart 1: ARS/USD (blue line, left axis) and TRY/USD (red line, right axis) exchange rates from 2013 to 2018. What are the conclusions? Well, although several emerging-market governments, companies and households have piled up really worrisome worth of dollar-denominated debts, a full-blown global debt crisis is still unlikely to explode. It’s true that Argentina and Turkey deal with economic crises – and the Fed’s tightening is not helping them but these countries suffer from many problems unrelated to the dollar and the U.S. interest rates. One cannot blame the Fed for poor economic policy in Argentina and Turkey, not to mention socialist Venezuela (just as the euro is not responsible for Italy’s structural problems). Other emerging markets are doing quite well, which clearly shows that the Fed is not as evil as it is believed. To be clear, we are not fans of central banking and we do blame the Fed for business cycles and macroeconomic instability. But we simply do not see how one could link the Fed’s modest reduction in its balance sheet and still accommodative policy overall with the economic calamity in Venezuela (yeah, nationalization of companies, printing bolivars and price controls have nothing to do with it) or currency crises in other countries. If you build a house of straw or sticks, then the lightest puff could blow it down but should you blame the wind or the poor material? 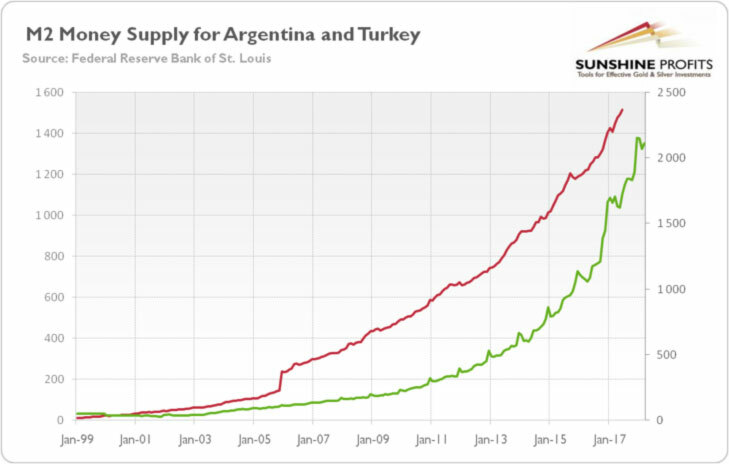 What we are saying is that Argentina and Turkey suffer economic crises not because of the Fed’s recent hawkish actions, but due to the reckless domestic policies, including irresponsible monetary policy. 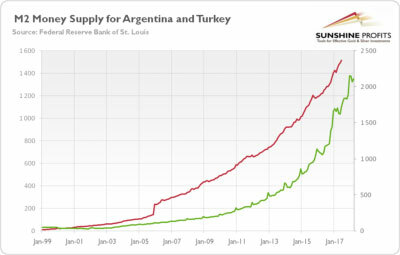 Consider the next chart, which paints the gargantuan increase in money supply in both these countries over the recent years (Turkish M2 lira supply has increased from 300 billion in 2007 to 1.5 trillion ten years later, while Argentina M2 peso supply has increased from 140 billion to more than 2 trillion in 2018). In that context, the Fed serves simply as scapegoat. Gold investors shouldn’t be fooled by the emerging markets’ policymakers. However, the recent Argentina and Turkey’s problems should be a wake-up call. Negative shocks can happen to any economy, and it should be very foolishly to assume that present exceptional environment of ultra low interest rates will last forever. The problem with unexpected crises is that, well, they are unexpected – but real and painful. For example, one cannot rule out a temporary slowdown of China’s economy, or a market panic about Italy’s economy. Having said that, the precious metals investors should remember that the emerging market crises do not necessarily boost the gold prices. Investors simply shrug off crashes in developing countries – or they resort then to the U.S. dollar. The history of the Asian crisis may be the best example that the financial turmoil does not always have to be reflected in sky-high prices of gold. If the market turbulences are caused by the U.S. economic expansion and the resulting Fed’s tightening (which is not so certain, as we showed), it’s unlikely that the price of gold will rally. One should always see the big picture when investing in precious metals: not all light comes from sunshine, and not all crises support the gold prices. If you enjoyed the above analysis and would like to know more about the link between the emerging market crises and the gold market, we invite you to read the July Market Overview report. If you’re interested in the detailed price analysis and price projections with targets, we invite you to sign up for our Gold & Silver Trading Alerts. If you’re not ready to subscribe yet and are not on our gold mailing list yet, we urge you to sign up. It’s free and if you don’t like it, you can easily unsubscribe. Sign me up!